Photoshop Classes, Tutoring, Consulting in Boston, MA. Have you ever made a selection in Adobe Photoshop, and copied it into another photo with a different color background, then noted that it looked cut and pasted, and that its edges did not blend smoothly into the new background? Antialiasing and feathering are of no use if you intend to move your selection to a background of a different color, because such techniques for softening a selection also result in a fringe around the edges. Your best bet in Photoshop is to create a border along the edge of your image, which includes a thin area on the edge of your selection and a thin area of the adjoining background and to blur those areas together. Here’s how. SYNCHRONIZE IMAGES. First check to make sure that the resolution and color space (sRGB, RGB1998) of both images are the same, and if necessary, change one to match the other. SELECT YOUR OBJECT. Use a selection method (magic wand, regular lasso, magnetic lasso, quick mask, extract filter) to select the area you wish to copy into another picture; we’ll call it the source object. If using the magic wand or a lasso, do NOT turn on antialias or feather. Such options will smooth the edges, but in the process will create a fringe related to colors in the adjoining background. If using the magic wand, and if the background is primarily one color, you may find it easier to select the background, then inverse your selection. PERFECT YOUR SELECTION. Clean up your selection, looping while holding down the alt (option) key to remove unwanted portions, and shift to add wanted portions to your original selection. OPTIONAL SAVE: If you might wish to return to your selection in the future, do select, save selection and name your selection. use control h to reveal your edges again. if necessary, do further cleaning up with alt and shift. 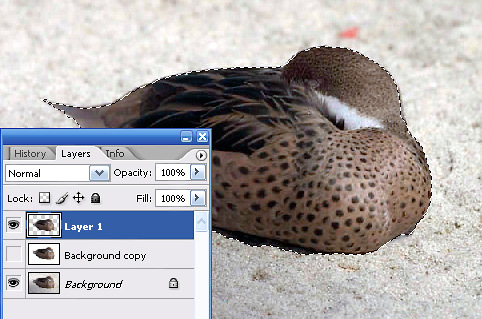 Control J to place your selection on its own layer, then layer, matting, defringe, 1 or 2 pixels). With your object selected, edit, copy to save it to memory. Then open the target picture and do an edit, paste. Alternately, instead of steps 7 and 8, if you have both images open, you can use window, arrange, tile vertical to tile both images side by side, and then drag your selection into the target image. Resize if necessary, using edit, transform, scale. Use the move tool or your arrow keys to reposition your selection on the image.